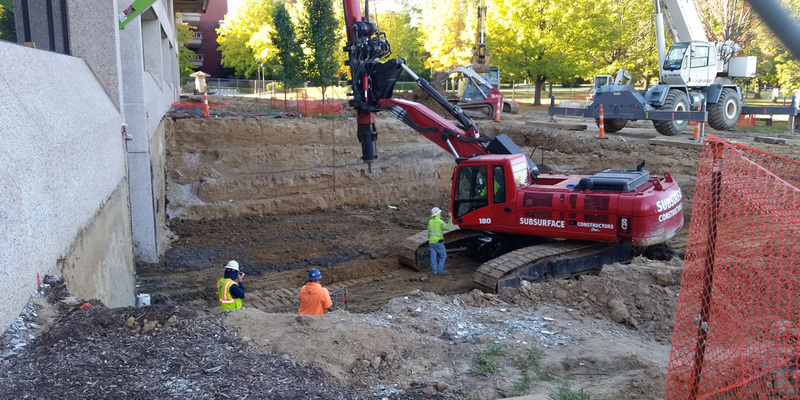 We are currently installing steel caging for the northwest tower foundation and will begin pouring foundation concrete at the southwest tower on Monday, November 19. Inside, we will continue mechanical, plumbing and electrical work on the 2nd and 3rd floors. Over the Thanksgiving break, we will complete structural reinforcement of columns on the first floor. During the Christmas Break, we will reinforce columns to support the new penthouse on the lower floor. Additionally, extensive mechanical, electrical, plumbing, heating and ventilation work will continue. We continue to monitor particulate matter data throughout the building. The most recently collected data (11/14/2018) showed all locations but one were below 6,000 parts per million (ppm), with most well below 4,000 ppm. The one location over our screening criteria is close to the north entrance, and a result of outside air infiltration. Outside air has been shown to be regularly higher in particulate matter than inside the building. As always, University Emergency Management and Safety will continue to monitoring levels of particulates throughout the construction process and address any issues that may arise.